Seek a good Minecraft-themed game? Look no further…let us present you Minecraft Y8 Edition, the latest game here. Makendi Francis (KingBlaze78) is the one created this good Minecraft game – the exclusive edition for Y8. This game was posted on Y8.com on 11 May 2018. 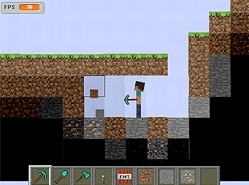 Minecraft Y8 Edition is an online simulation game like Minecraft for kids. Built with Flash technology, the game can work compatibly on different web browsers. If you want to taste the indie sandbox game of Mojang, download it here! Right now you are lost in the open-ended blocky world. Like what you have to do in the original, this game features the similar gameplay – discovering the vast land, mining for resources and materials, hunting for food and killing evil creatures. As the journey begins, you will find several essential tools, like an axe, shovel, spatula, and TNT, which are very necessary for your tasks. Quickly craft a shelter for hiding before the sun goes down because your enemies are lurking around. Without any safe place, you will get attacked easily and the adventure in this game will immediately end. How long will you survive in this world? As a Flash game, Minecraft Y8 Edition can be savored in your browser without any trouble. Now the game is available to play at our game site, absolutely free. Not only Minecraft Y8 Edition, but we also add a lot of games like Minecraft of different genres which may satisfy your need. For big fans of Minecraft, the hit sandbox game, the recommendation here would be Orion Sandbox, Minecraft Tower Defense 2, and Water Miner. Enjoy your day with PlayMinecart!